I’ve had one of those efficient days. I blame my husband. He was working from home today, so I kind of felt like I had to look busy. So not only did I do much washing, cleaning the fridge and packing for skiing, I also attended to some of those little odd jobs that I feel I’ve are part of my remit. We have a bathroom on our back verandah. I had it renovated two years ago, and it was fully as painful as the current indoor bathroom refresh. 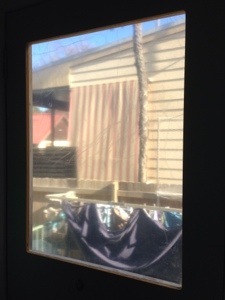 It has a door leading outside to the washing line with a large pane of glass in it, giving a clear view of our neighbour’s back verandah. Conversely, giving them a clear view of us showering. I can’t help notice that they’ve put up a wooden screen. See? On top of the fence, on the left. Now I don’t really care if they see me showering or not, but my parents in law are coming to mind the house and animals while we’re away next week, and they may be more shy and retiring. And they don’t have a choice, if they showered in the indoor bathroom the would be water everywhere due to the continuing lack of a shower screen. So it is time to frost that window. Yes, the door was supposed to have a frosted window, but the bathroom people, when met with that suggestion, just gave a resigned shrug. Hardier souls would have taken it up with them, but not me. No. I waited two years, then got me up to Bunnings for a $16.99 roll of window frosting. It’s next to the fly screens. It’s easier than covering books with contact, that’s for sure. 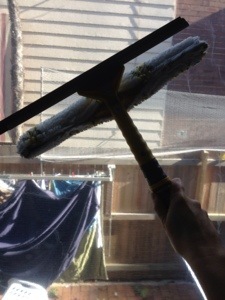 You wash the window with a spray bottle of water and your trusty Enjo window washer. You discover that the glass is already covered with a plastic film. I knew the outside was, because it’s starting to decay and flake off. So out with the Stanley knife, after you’ve retrieved it from under your daughter’s pile of “craft” on her desk and gently trace around the frame, then it just peels off in a rather satisfying manner. You cut a piece of film slightly larger than the window, then lay it on the floor. You peel off the backing and spray the sticky side with water, which appears to stop it curling up on itself like contact does. 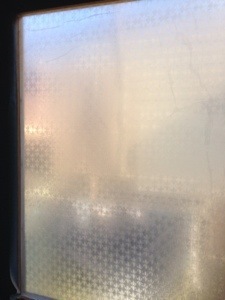 You then press it onto the window and squeegee it down to remove any bubbles. I don’t usually say this, but et voila! Flushed with success, I turned my handy attention to the next family complaint. This was that the new tap in the new sink in the new bathroom was a bit too enthusiastic. Could I get the plumber back in to have it tamed down? Not on your nelly, I’ll have a crack it myself. Have you looked under your bathroom sink? 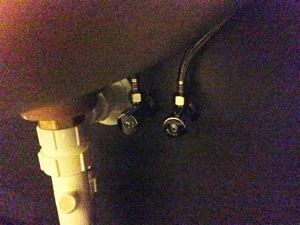 Chances are you’ll find that the taps are attached to woven metal pipes which have their own taps. You need to keep an eye on the hot pipe, they need to be replaced about every five years because they rust. Also a simple Bunnings job. Anyway, turn the sink tap on full in the cold position, then turn the tap under the sink counterclockwise until the pressure drops to your satisfaction. Do the same for the hot side. Plumbers, who needs them! I also finished a kind of crocheted mitten without any fingers, it’s more of a tube with a thumb hole really, and now I just need to make one more for my left hand. But instead I’m making a pompom for the Muffet’s beanie. I can’t tick off too many things on the list, I’ll be setting my standards too high.